There is no-one in the hotel reception, no-one other than the recording eye of a CCTV camera sees me park the bike against a wall and collapse onto a large sofa. I haven’t the strength to look for a room. I cover myself with my gilet and close my eyes, grateful to be horizontal. Sleep is restless and I am woken after an hour by uncontrollable shivering. I try to get warm and doze until 6:30am when the first of the hotel staff walk into the lobby. I’m surprisingly coherent as I explain what happened. I had emailed the hotel during the day and evening and I locate a note asking me phone a number when I get in but it’s too late now. I find a toilet and change my kit. I can’t bring myself to take off the underlayers, but a change of shorts, socks and mid-layer makes me more comfortable. I clean the dirt off my face and reapply suncream. I’m in good shape, no saddle sores or sore muscles but my stomach feels ropey. I won’t be tucking into a full English breakfast or I’ll see it again on the first hill. The weather promises another day of glorious sunshine. It’s too early for the other guests to come down for breakfast but the man with an Irish name working in the kitchen takes pity on me and brings toast, yoghurt and a very large pot of tea. I WhatsApp the Audax Ireland group with updates. The Garmin tells me I’ve done 160km and 3,000m since Abergele yesterday. Total climbing so far 9,276m, no wonder I’m knackered. The route instructions suggested only 10,600m for the total ride. Ah well, only 135km left and 10 hours how bad can it be? Just before 8am I wrangle the bike back out through the doors of the hotel. As preparation for the ride I’d read the organiser’s blog where he describes the climb out of Llangollen as being just as tough as anything else on the ride. He’s right, it is. So much so that I hadn’t put my cycling shoes on in the expectation that I’d be walking up it and I do, the contents of my stomach sloshing uneasily with every step. A woodpecker drums in the woods as my feet plod upwards. Another plateau, another hairpin descent, thumbs straining on the hoods. My disc brakes are pulsing with effort. Coming down a god-forsaken back road, last resurfaced when there was a Welsh king on the throne, I meet a farmer in a tractor. I stop to let him pass and he rolls down his window and says in response to my greeting, “You’re not local, or else you wouldn’t be coming down this!”. I agree and ride on. Up another sheep infested valley to the top of a ridge. My mobile phone signal had been intermittent and now I have perfect reception. I can hear the ting of notifications of messages of support and good luck. The sun beats down, the ridges of hills bob up and down, blue-green in the heat haze. 10,000m done with 100km left. I’ll finish this. Llanfyllin is sleepy on a Monday morning. I find the control point outside a hotel and take the opportunity to refill my bike bottles. I’m trying to make the calculations, will I make it back by 18:10. It’s going to be tight. The elevation profile on the Garmin doesn’t get any better. I try not to think about how far I’ve come in the last 48 hours and just concentrate on getting back to the start. Over another ridge and another, more walking. If it wasn’t for the fact that the road signs change and the distance to the finish lessens I could believe that I’m riding an endless loop. I remember my least favourite part of the London-Edinburgh-London ride in 2017 was the Lincolnshire Wolds. 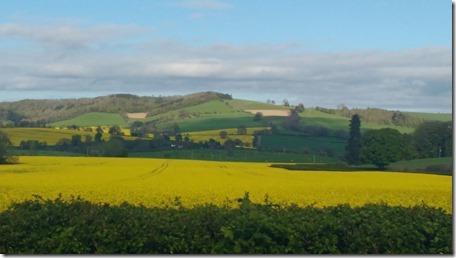 What are the Wolds but a series of steep little river valleys with sharp ascents. I really hated that section on the way up to Edinburgh and it preyed on my mind until I rode it again on the way back down, I still hated it. Wales is a never-ending circle of hellish small river valleys. The final words of the Johnny Cash song “A boy named Sue” came to mind paraphrased as ““And if I ever ride a Super Randonnee, I think I’m gonna ride it in Spain or France! Anywhere but Wales!”. Another ridge of hills waits for me outside the town. This time I don’t walk it, it’s not steep enough. Head down, feet firmly on the pedals I winch my way up by sheer effort of will. The open moorland with its skylarks and sheep opens before me. I can see wind turbines on the surrounding hills. Of course the route goes over them rather than around. One more control at the top of a hill in the village of Bwlch y Sarnau. 16:30, 30km left. On any other day easy peasy but not with one hour of sleep in the last two days. The road does not take the easy way back to Knighton. I rejoice when I finally reach some smooth A-road and then nearly cry at the climb out of Llanbister. I can’t believe it’s this hard even at this stage. I should know better. Only 10km left and half an hour until my mandatory 60 hours run out. As ever in an Audax, I turn left and up yet another steep hill across moorland. I can feel myself beginning to think I won’t make it. I try and go faster but my body is used to one speed by now and protests at the demands I make of it. Down a final rutted track, luckily traffic free, I reach the town sign and inevitably the last kilometre is up a hill. I reach my destination just as the 60 hours allocated to a Super Randonnee run out. I sit on the steps of the clock tower and can’t believe that I did it. It seems ridiculous. The life of the town goes on around me, no-one takes any notice of a bedraggled middle-aged cyclist sitting on the steps. There is no welcoming committee, no fireworks, no winning post. Final statistics according to the Garmin, 617.1km, 11,995m, 37:21 hours moving time, 16.5kph average speed. My alarm wakes me at 5:30am. I scurry around repacking my pannier bags, despite my best efforts the day before I have comedy sunburn on my arms and fingers giving me the appearance of invisible gloves. Sun cream reapplied and with two protein bars and a battered banana inside me, I collect my belongings and sneak downstairs to get my bike. The mist from the night before still shrouds the village and I’m happy with my decision to stop. The road onwards is a false flat along the valley floor. The sun is up and it promises to be another windless, sunny day. 10km of undulating narrow road brings me up another valley. My bike scares a pheasant into the hedges and rabbits flee when they spot me. A nice descent along the contours of another valley brings a sting in the tail with a steep ascent back to the A road. Welsh roads sometimes tell you how steep the descent is but not how steep the ascent is on the other side. Once you see grit boxes you know you’re in trouble and it’s over 20%. By then my 34×32 isn’t low enough and I’ll be walking. 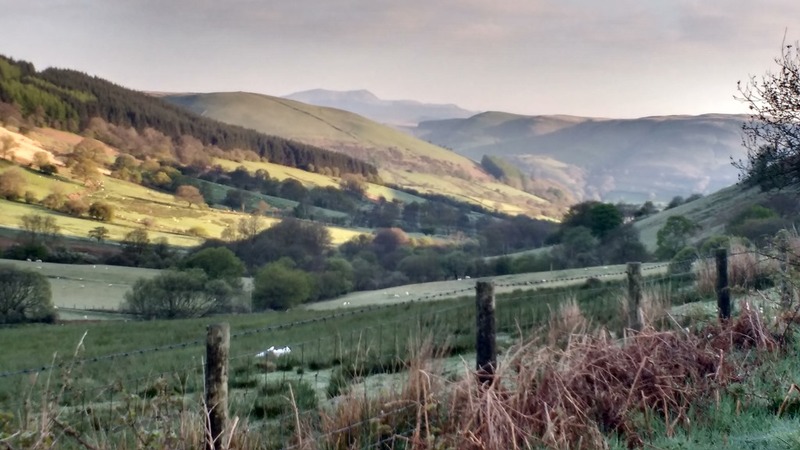 Through the small hamlets on the road to the climb of Bwlch y Groes, it’s waiting for you and it’s a magnificent climb when it appears around the bottom of the valley. You see the road twisting its way up the side of the mountain and you know you will be riding up it, there’s no way out now The final km before the actual climb is steep enough. Two early morning walkers with their dog moved out of my way but I told them I’d be going slower than them and not to bother. My legs carried me up the first part of the climb but then I couldn’t go any further for the final 1km. There was a sheep on the road with one crumpled horn that frankly took the piss. It stood in the middle of the road eyeballing me, then it would trot ahead of me, wait for me to catch up and trot on defecating as it went. My walking method on steep hills was to stop, change cycling shoes into a pair of runners stuffed into my panniers, walk 50 paces, pause, walk, pause etc. When the road flattened to less than 12%, change back into cycling shoes and cycle off again. The sheep kept me company right to the top of the climb only turning off into a field with other sheep when the fencing ended and the open moorland began. The sun was merciless and the views were fantastic. The descent to the lake before Bala was uneventful apart from the bone-rattling cattlegrids. The lake was mirror smooth with the surrounding mountains reflected perfectly on its surface. I could just make out the church towers of Bala in the distance and the prospect of breakfast. Bala was bustling, motorbikers roared up and down the main street. Cars with colourful kayaks on roof racks passed towards the lake. I locked the bike outside a Subway and then sat in the sunshine beside the statue eating a ham sandwich, milk, tea and yoghurt. I wasn’t feeling too bad but I was concerned about time given that my progress didn’t seem to get any faster. Once I left the A road it was back to the now familiar grotty farm roads following the contours of streams and steep little valleys. I could just hear the roar of motorbikes on the A road in the bottom of the valley. 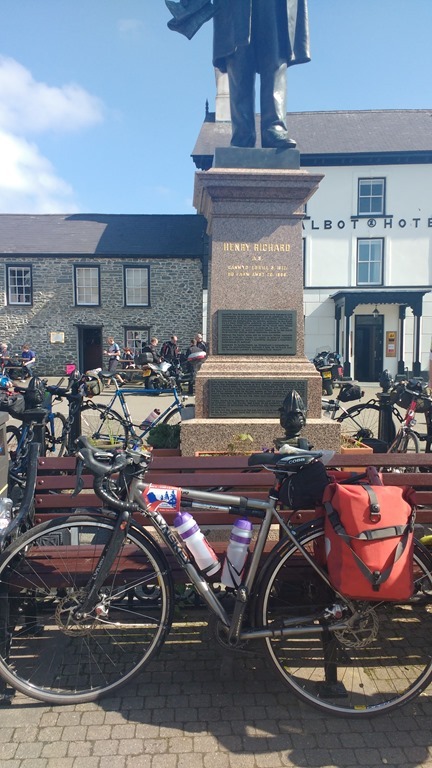 The route passes close to Frongoch, site of the infamous post-1916 internment camps that educated many an internee in the ways of Irish Nationalism. It’s all been razed now with nothing to see but fields and hedgerows. 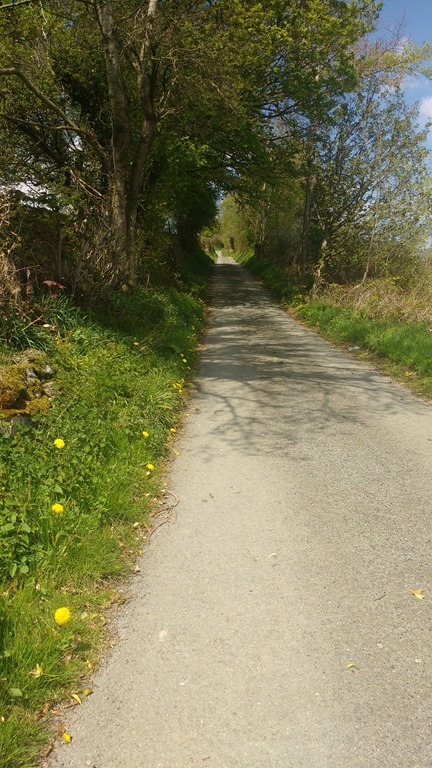 The evil road between Llansannan and Llanfair Talhaiarn. The route becomes more convoluted at this point and criss-crosses itself. The stretch between Llansannan and Llanfair Talhaiarn is some of the worst road I encountered on the whole trip. The Garmin indicated that I was to go up a road in the village that had a sign saying it was unsuitable for heavy vehicles in two languages (my Welsh was becoming more proficient as time passed!). The road briefly turns a corner and then goes straight up a wall, a badly surfaced wall with grass in the middle. The Welsh believe that hairpins are for wimps. If there’s a hill, you’re going right up it with no deviations. When it eventually flattened, I bumped my way around potholes, through farm muck and through patches where there was no surface at all. Coming to the descent I was treated to a sign informing me the gradient is 30%. Reader, I walked the last 100m, fighting the bike that wanted to slide sideways down the hill. 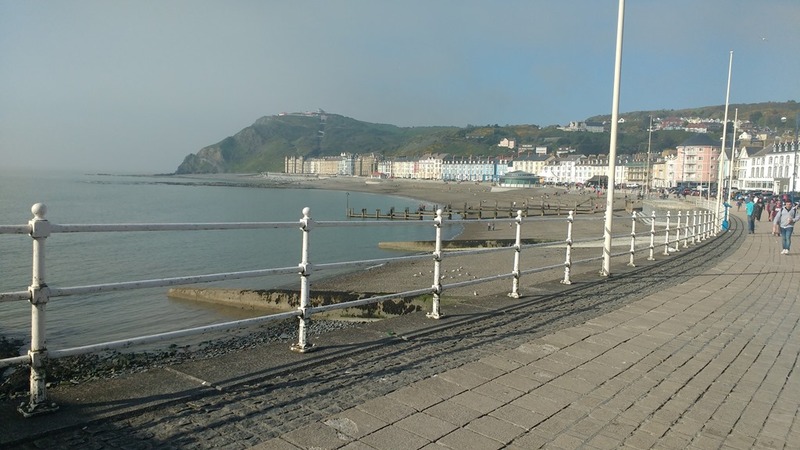 The route then takes the main road to Abergele, an honest climb up and a nice easy descent into the town. It was 14:47 when I parked my bike in the back of the George and Dragon pub. 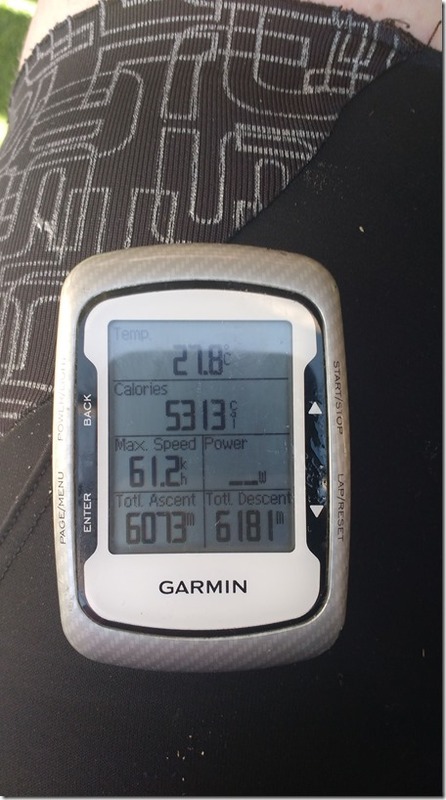 While I ate red pepper soup and refilled my water bottles I looked at the Garmin: 316km done, 6,073m climbed at an average speed of 17.2kph, slow REALLY, slow. Retracing my way back to Llanfair Talhaiarn the road turns West and on to Snowdonia. The climbs get longer and more spread out, the mountains are bigger. Having said all that, the mountain road section after Llanrwst on the way to Capel Curig is nasty enough, grit boxes line steep slopes through a forest and then there are speed bumps covering drains on the way down to the main road. The main road to Llanberis was thick with motorbikers and cars. People sat outside pubs enjoying the afternoon sunshine. Two lads zipped past me in kit on the way up to Llanberis Pass, there was no way I was going to keep pace with them. 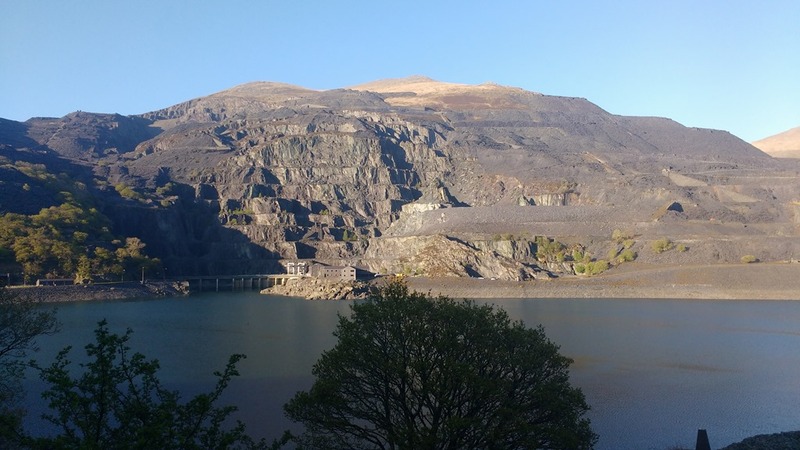 Llanberis Pass was an absolute delight in the way up and down, just find a low gear and use it. There were plenty of walkers at the top of the Pass. I stopped to take a photo and a woman approached me and asked about the LEL jersey I was wearing. Her boyfriend had ridden it last year the same as me. She was amazed when I told her what I was doing in the middle of Wales. Trying to explain why you’re cycling 600km, solo, in two and half days to a normal person sounds kind of daft. No, it’s not for charity, yes it’s fun! Bidding her goodbye, I rode down the Pass into the setting sun and Llanberis. A quick stop, 18:47, 370km done. Llangollen was my next hotel 110km away. I was feeling better than I had 24 hours earlier. My legs were grand but I couldn’t go any faster. Based on my average speed it was going to take me many hours to see a bed. Back up the Pass, the last of the walkers trickled past me on the way back down to their parked cars. The motorbikers had disappeared and I had the roads to myself. Ascending the mountain road to Llanrwst wasn’t as bad from this side, those were some hills that if I never ride them again it’ll be too soon. The sun had completely set by the time I reached Llanrwst, the mountains had gone from gold, to plum and purple. 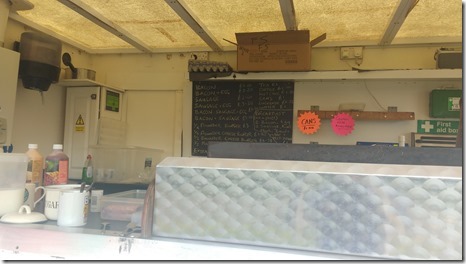 I stopped to get some food in the main square in Llanrwst. The counter staff were cleaning an overworked ice-cream machine. A large capuccino, sandwich and two yoghurts were my main meal. I still had a banana and various protein bars in my pack and on my person. 9pm. 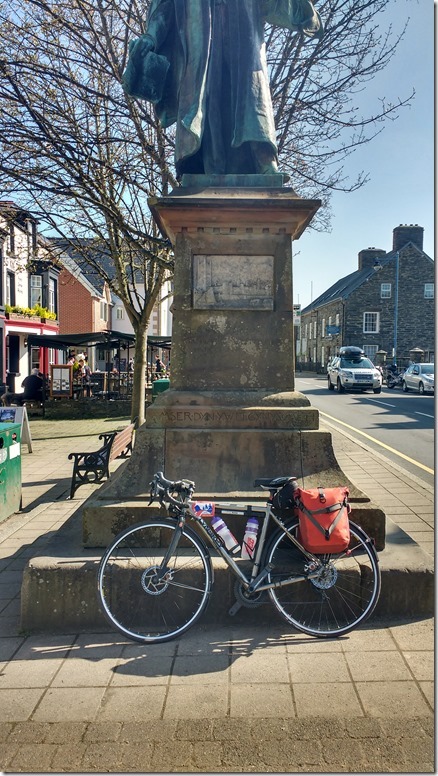 The climb out of Llanrwst went on, and on, and on. It didn’t help that I knew the road from earlier in the afternoon. The night wasn’t completely black with no mist, I could tell when the top of a climb was near, the trees became silhouettes against the stars and I could feel a slight breeze across the crest. It was a perfect star filled night. I’m pretty sure I saw the ISS but it didn’t see me. The sun was gone but a faint glow could be seen on the northern horizon. Behind me the Snowdonian mountains shrank into the night. The road to Denbigh was back to the usual up and down across steep sided valleys on small roads. In the dark all that could be seen of the road in my lights was a wall rising up in front of me. Not enough time for recovery between the steep climbs. Few cars passed me, god knows what the occupants thought. Somehow I missed a turn on a corner after Llansannan, 2km later I realised my mistake and retraced my route back up a hill. The clue that I had gone wrong was that I was going down hill. More valleys until a lovely 4km of flattish A-road into Denbigh. Trying to photograph a castle in the dark at 1am is nigh on impossible. As I tried to clip in on a steep hill after the castle, I fell over, scattering jellies from my bar bag with the bike on top of me. Nothing damaged but I could feel where the bruises would appear on my legs and arm. Next stop Mold. Even in the near dark I could see a ridge of high hills barring my road. By now some 430km in I know that the route is definitely going over them not around them. Again the road goes straight up, no mercy shown to a small tired woman with a heavy bike. I have time to read the road signs as I gamely walk the bike. Moel Arthur, similar to “maol/bald” in Irish. It is indeed a tree-less hill. Down to another A-road and respite before Mold. On the way into Mold a blood-red rising moon hangs over the town, surreal in a star lit sky. The glow of the towns over the English border is visible in the East. Mold is quiet at 3am, nothing but taxis and the odd bread van. The route turns south up into the hills on the way to Llangollen. I’m tired but coping, by now I know that no matter what I’ll have to be on the road again before 8am. Not much sleep for me tonight. The first light of dawn is appearing over my left shoulder as I turn off a minor road onto a farm track. Sheep appear in my front light, sleeping on the trackway itself. They are not impressed by me and they bleat and their lambs huddle beside them. This time three farm gates bar my way. I wrestle with them and the bike twists away from me threatening to fall over again. The last drag up to the top of Horseshoe Pass is only bearable because I know Llangollen is near. The route takes a minor road at the top of the pass. I career down a rutted track on the side of the mountain, the houses below me in the valley distorted to doll size from my perspective. Nearly 22 hours on the bike and I pray to any deity that I don’t crash now. Over speed ramps and back onto the A-road into town. A quick photo beside the railway station and I barge my way through the double doors into the reception area of the hotel as the town clock strikes 5am. 475km 9,276m. Cambrian 6C Day -1 and Day 1. Rolling my eyes at the Dublin bike cyclist breaking the lights, my pannier laden bike threaded its way through the morning rush hour. The trip to the ferry was uneventful, all the HGVs were going the other way. The sea fog drifted out of the way as the ferry neared the harbour. RAF jets split the sunshine in the skies over Holyhead, the roar of their engines competing with the screech of seagulls. While I waited on the train platform I met a woman who remembered me from the train journey after London – Edinburgh – London. She works on Virgin trains. It’s strange how some people’s faces just stick in your head. The small train was full of the scrummage of a bank holiday crowd. School kids hopped on and off again, their chatter filling the carriage like a flock of starlings. Weary commuters shuffled on, their burdensome bags cramping their feet and seats. I changed my plan and decided to cycle the last 16km to my hotel for the night rather than waiting an hour for a change of train. Small country B roads and rolling hills like a lumpy bed were my lot for the ride. I dislike summer cycling principally because of the flies that smear your mouth and glasses. Give me a cold winter day,crisp after frost with no wind rather than a muggy, sticky July day with rain on the headwind. A sleepy village with a duckpond and alpacas in the fields is tonight’s destination. The small country hotel is quaint but well run. I explain to the owner that I’ll have to leave at 5am and his raised eyebrow invites an explanation of my crazy endeavour. I’ll be back here on Monday evening and I’m looking forward to a pint of the local cider. Up at 05:00, kit on, suncream on, bottles filled and a last check of my equipment. If I’ve forgotten anything it’s too late now, it’s back in Dublin. 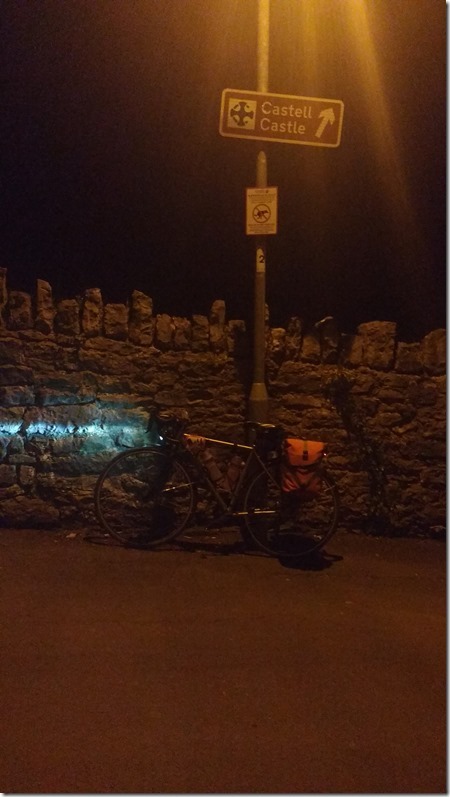 I’m tired, I slept fitfully, I never sleep well before an Audax. I’d made arrangements with the proprietor the night before to get the bike out of the shed and leave the keys in reception. The hotel cat was happy to see me and then unimpressed not to be given his breakfast. The moon was still in the sky and the sun was just rising above the mist filled valleys. 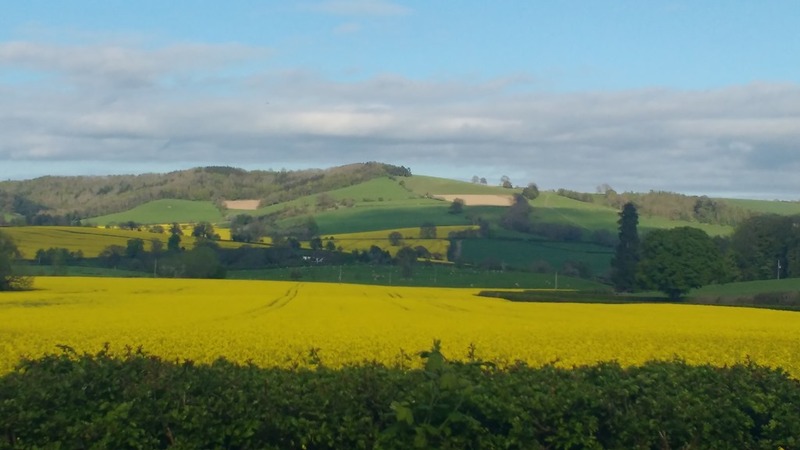 The road gently undulates along the valley floor, it’s only 9km to Knighton. Above me a red kite hovers, wings spread, suddenly it swoops down towards the road right in front of me, the rising sun turning its wings to fire. Not finding what it sought the bird wheels away into the dawn. There are few cars on the road at this hour, I pass small factory, evidently there’s a change of shift with people coming and going. Reaching Knighton I take the first obligatory photo of the bike at the foot of the clocktower as proof of passage. The Garmin takes a few minutes to load up the route so it is 06:10am when I officially start. The climbing starts from the off, out of Knighton and straight up a 2km hill. It’s not too bad but I’m slow and the bike is heavy. This sets the standard for the next 60 hours. Up and down river valleys, one hill after another like beads on a chain. The scenery is fantastic, it’s Spring so the trees have blossom, the last of the daffodils are out and the baa-ing of sheep and lambs is my constant soundtrack for the two and a half days. 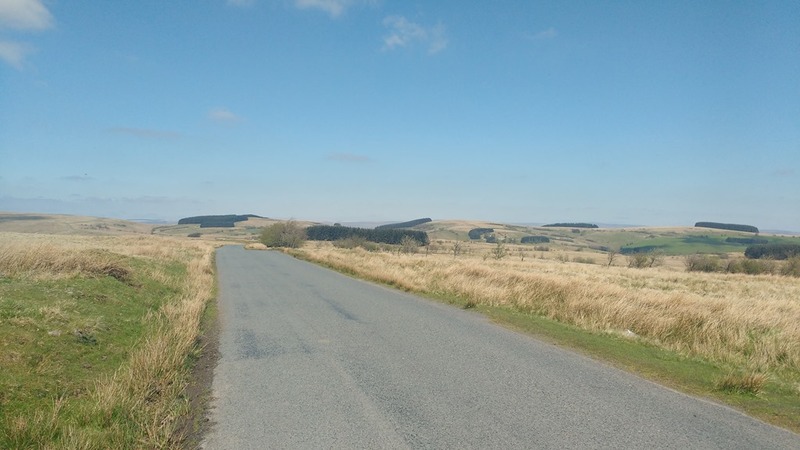 The hills are unrelenting, there’s very little flat in this part of Wales and the route deliberately runs across all the hills to ensure the correct elevation for a Super Randonnee of over 10,000m. Crossing one small valley I can see a beautiful white tower glowing in the sunlight above the last of the morning mist. It turns out to be a church in Old Radnor perched on the crest of a ridge. As I chug my way upwards I see my first swallows of the year perched on the phone wires. More hills and farm laneways. I have to shove into the verge if traffic comes the other way. The corners are tight, the kind where you scrub speed in case you meet something coming the other way. Relief arrives in the form of an A road with its wider lanes and better surface. The first groups of motorbikers zoom past me heading into the mountains and towards the sea. By now I’m getting hungry, I spot a sign for a café “Jodi’s 1 mile” and decide that breakfast would be good. 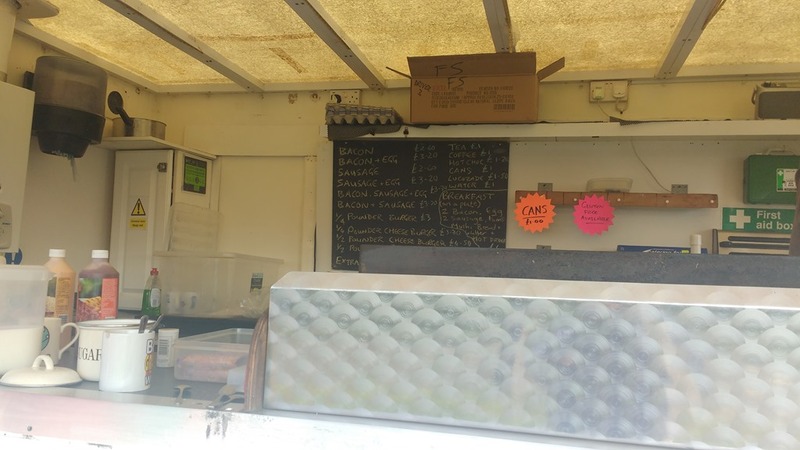 Jodi’s turns out to be a mobile biker’s cafe in a layby. He’s cooking up bacon buttys for two bikers when I arrive. I order “Breakfast on a plate” for £6, bacon sausage mushrooms, tomato and beans and a large mug of tea. 5 minutes later I’m sitting at a picnic table stuffing my face. 45km and 850m climbed. The next 15km to the first control at Brecon is uneventful, minor a roads and a nice descent into the town. The town is busy with bank holiday traffic and I scan the narrow streets searching for the statue of Dublin-born Duke of Wellington. Bike parked, photo taken, quick WhatsApp message to the Audax Ireland group and I’m riding back up the hill out of town. Turning my back on the Brecon Beacons, the route leads me up a pretty river valley containing the hamlets of Lower Chapel and Upper Chapel. The climbing continues and I overtake a heavily laden cyclist with multiple panniers on his bike as the trail crosses the army ranges. A red flag faintly flutters and the skylark song is interspersed with the dull thud of gunfire. As I round the crest of a hill, a group of bare-chested men are shearing a flock of sheep. I grin and give them a thumbs up. Across the top of the plateau, the vista of Welsh mountains spread as far as I can see. I try not think of the ones I will be climbing up over the next two days. A sharp and steep descent with a bumpy road surface and cattle grids refocuses my attention. Llanwrtyd Wells is my next stop. A can of Vimto and a Feast ice-cream line my stomach before I ride on. The first of the major climbs, The Devil’s Staircase, is a few kilometres up the road. My eyes try to pick out the possible route through the hills. The mountain sides become barer and the road snakes upwards. I pass a sign for Abergwesyn Common and now I can see the end of the valley and the steep hairpins. Luckily there are few cars on this stretch. The organiser’s notes have given due warning of the steepness of the climb. I cross the inevitable cattlegrid and the road steepens to a gravelly wall in front of me. Clicking down through the gears, my legs pushing hard in the pedals, arms slippery with sweat, I grind to a halt just before the first hairpin. Stopping to catch my breath I dismount into the verge. For the first of what will become many times, I remove my shoes and push the bike up the remainder of the hill. This procedure, slowing, ignominious dismount, pushing bike, repeats for the next hill. Somehow I ride up the third hill. The descents are as brutal as the climbs, sharp and twisting. The Garmin records 61.2km even though I’m hanging onto the levers. The cuckoo’s call mocks my efforts from the cover of the forest in the valley. Shaken but determined I cycle on to Tregaron and the next statue. I am surprised to find the village square stuffed with cyclists. The benches around the statue are covered in cyclists and bikes are propped up against each other. From the kind of bikes and the jerseys of their riders I am among my own people, Audaxers! There is the usual event jersey top trumps to be seen, who is wearing the jersey from the longest or oldest event. I see PBP 2011, Mille du Sud and a LEL 2013. I recognise a face I last saw on a train platform in Paris after PBP 2015. 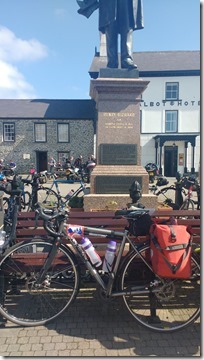 He remembers me and I find out that he and the others are riding the Brevet Cymru 400. They’ll be finished tomorrow evening, I’ll still be on my journey. I see a fellow participant from LEL 2017, I last saw her at a control with 364km to go but she made it back in time to London. Cheered by the conversation I take the long road to Aberystwyth. At first it’s lumpy, rolling A road and then the inevitable turn off onto a minor B road. Initially I miss the turn, lulled into a false sense of security by the good surface, but finding myself descending I realise that I should have taken the turn back up the hill. Once on the B road the surface is gravelly and rutted. I can see the better A road running almost parallel and wish that I was on that instead. Aberystwyth is inevitably at the bottom of a hill. It’s nearly 6pm and the sea fog is clouding the coast and greying the warmth of the sunlight. Snap of the pier building and I’m on the bike again looking for a Spar supermarket that I saw on the map when researching the route. I bring the bike inside with permission from the staff and munch a ham sandwich, tea and pint of milk. At this point I’m calculating how long and how far I’ll get tonight. 12 hours in and only 150km is very slow. I’ve another 100km until Bala and a lot of climbing. I phone the hotel in Bala and let them know it will be after midnight before I arrive. 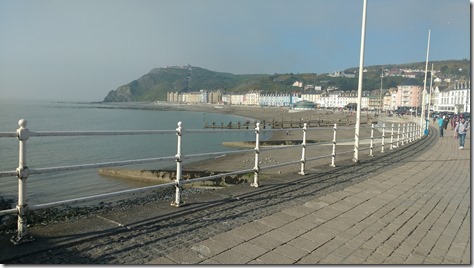 The sky is grey and the streets are misty and cool when I leave Aberystwyth at 18:30. The next 20km are a slow grind up the valley on the A44. There’s plenty of traffic and it makes the climb unpleasant, at least the road surface is good. As I ascend the hills, the sun reappears and the heat of the day returns. The mountains glow gold in the late afternoon sun. At the top of the pass I look back and see that the sea fog has followed me and is billowing up the valley sides. It’s a bit spooky so I change into big ring and relax into the descent. Llanidloes is the next control. As ever the straightforward road is brought to an abrupt halt by a sharp turn left up a steep hill and a minor road. Again I have to stop the bike, not to walk it but to open a farm gate that bars my path. The road is little more than a farm track. I encounter a flock of sheep walking along the road between fields. Trying not to panic them I slow to a crawl and cycle through. I begin to question the sanity of the route designer! The route passes the source of the river Severn. By now the sun has disappeared behind the mountains. The heat of the day is still in the buildings of Llanidloes. It’s nearly 9pm, 200km. I prop the bike against the Market Hall beside the Wesley stone. It feels slightly sacrilegious to take a photo. I layer up for the oncoming night, long fingered gloves, long sleeved jersey and reflective gilet and leg warmers. Right now this is too much clothing but it’s going to be a long night. Out of Llanidloes and up into the hills with the the first stars above me. 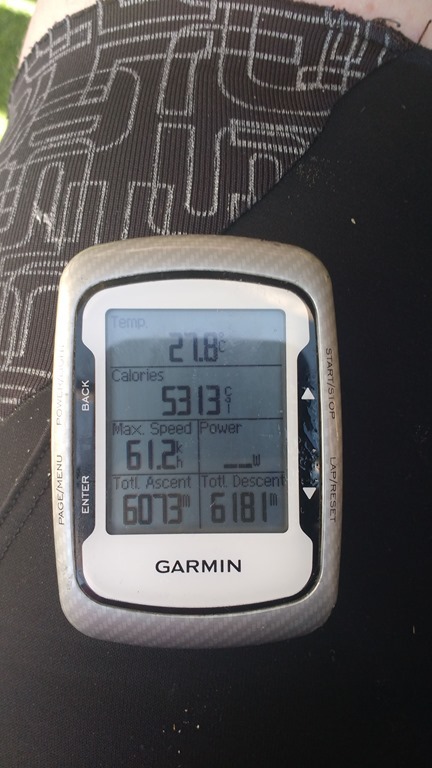 The road sign warns me that the gradient is 16%, the Garmin claims 20%, I believe the Garmin. Inching my way upwards I can just about appreciate the scenery, the last of the sunset reflected in the lake beside me. The thought that all this climbing means a descent is near keeps my legs moving, onwards upwards, just around the next corner. The early morning start and lack of sleep is beginning to cause me problems. Even though it is cold by now and there is nothing but starlight and my own headlamp to light my way, when the descent finally comes I can feel sleep closing my eyes. The fog cloaks the next village and I reconsider my plans for the night. I won’t reach Bala tonight. From the map and my own research the villages between Llanidloes and Bala become increasingly smaller. I decide that I’ll try for a bed for the night in the next village. I reckon my best way of finding somewhere is to find a pub and ask. I’ve slept out before and I have stuff with me and the local chapels look like possibilities at a pinch. Arriving at a small settlement I see a building with a family group of people outside chatting and enjoying a pint, the Wynnstay Arms. I park the bike outside and walk into the warmth and light of the pub. It’s quiet, only three customers at the bar and a spry looking woman with silver hair and twinkly eyes. I realise I look a sight but I ask if she knows of anywhere that might have a bed for the night. I can see her considering the situation but she informs me that she does have a room and I can stay. She lets me bring the bike inside, shows me to a room with a bed, gives me a towel for the shower and refuses to take any payment. By now it 23:00, 222km done and about 4000m. I ring the hotel in Bala and tell them I won’t get there tonight and thank them for their help. I WhatsApp my husband and daughter and fall into a dreamless sleep before 23:30.